As with rapid globalization and changing societal values and social movements, the number of female owned businesses is on the rise. The scope of women owned business venture isbright, with more than 126 million women entrepreneurs starting or running new businesses in 67 economies in 2012, according to the Report on Women and Entrepreneurship, GEM 2012. However, for a small country like Bhutan, women are often left out on many entrepreneurship opportunities, and during one of the SAARC Regional Meet, which was conducted to discuss policies to enhance women in business, it was discovered that Bhutan was the only SAARC member country to not have a separate platform for women entrepreneurs. 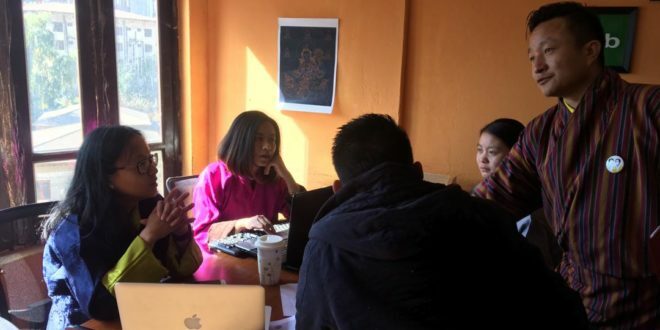 “This is the first time that we are organizing Techstars Startup Weekend Women’s Edition in Thimphu scheduled from 23 to 25 November, and we are positive that this women’s edition will garner lot of interest, indicating that women are ready to change the narrative of being left out of picture,” Deepika, one of the organizers, said. Techstars Startup Weekends are organized by community leaders who are passionate in building the community and who believe in growing and giving back to the society. This event is specifically for women and the lead organizers are three women; Pema Chozom, Deepika and Kuenzang, from diverse professions but with common belief of giving back to the society. They are supported by two men Tashi and Tshewang as part of the organizing team. Techstars Startup Weekend is a 54-hour program that runs over the weekend from Friday to Sunday. The format is designed by techstars which is a global ecosystem that empowers entrepreneurs to bring their new products and services to the market, wherever they choose to live or build great businesses in the world through Techstars Startup Program, Accelerator and Ventures. The selected ideas pitched on Friday, based on the highest votes received, will form a team and work on building a minimum viable product to be presented on Sunday to the judges and participants. While doing so, the teams are introduced to best of the best mentors who will guide the teams and help to clear the roadblocks when necessary. The program is organized with the objective to help in economic empowerment of women beside promoting entrepreneurship and innovation culture among women. “Even if a woman is at a stage where she is skeptical or not sure what next in her life, she can participate in this event and explore her potential to be a startup. Any idea in any field is opened for pitching in the event and the environment is the safest to test. Missing this opportunity by women will be a great loss. So all the women, women up and test your potential in this upcoming Women’s edition from 23rd -25th November 2018”, the organizers added.